This documentary by Kristopher Belman was a happy accident, as he began to follow James and his crew in their Freshman year at St. V’s. Subsequently he was able to document the rise of LeBron James from local Akron schoolboy to NBA basketball superstar. And it all started in a Salvation Army tile floored gym, with a core group of like minded winners, including the spiritual Coach Dru Joyce II. HollywoodChicago got to interview the remarkable cast that played with James back in those days. Dru Joyce III, Sian Cotton, Romeo Travis and Willie McGee all sat down and reflected on life in the spotlight and a life in basketball. After the interview a playful LeBron James stopped by, and agreed to take a picture. The legendary team were back together, where they belong. HollywoodChicago: Since you won so many games in high school how did it feel to move onto other teams where winning wasn’t as common? Romeo Travis: Winning is a mentality. Everyone doesn’t have that mentality. Some people can lose, and because they played good. They can say they had 30 points and be happy. But we lost. That’s missing the whole picture. You have to look at the big picture. Willie McGee: It’s difficult to go to another team just because of the camaraderie we had at St. V’s. Then you get new teammates, I played football in college so I went from 12 people to 50. You don’t have the close bond, you have to re-learn how to communicate with people. You have to learn how to approach certain teammates to get positive results. It’s was a difficult transition. Sian Cotton: A lot of people don’t know how to win. I feel like I was a born winner, even in life, even in basketball. That is how I was brought up, I’m a winner and you don’t lose. But everyone is not a winner. Dru Joyce: Romeo and I walked into a team where losing was contagious. There were guys who won before but the success of the university from those years effected everybody. We’re coming from a program where we lost five games in four years. Romeo and I were ready to fight our teammates, how could they accept losing? We lost 15 games our first season, under .500, I’d never been in that position. That was unheard of to me. HC: When did director Kris Belman’s camera bother you the most? When were you glad he was there? DJ: At time we were getting used to it, we were already used to the cameras being around. Kris was such a good guy and also he was a professional, even at that time. He just laid in the background. He did such a good job I didn’t notice he was even there for a day or two. RT: A lot of times he would just set the camera up and let it record. DJ: When we won the National Championship game, and the post celebration on the bus, that was epic. It’s great to experience to make me feel how I felt that day. And I was very excited that he was able to capture that. HC: At the peak of your team’s and Lebron’s popularity, what behavior did you find to be the strangest? When you observe Lebron’s fame now, do you think it has made him more cautious and less open? DJ: That adults were so inclined, and so attentive, to what a group of 17 year olds were doing. It was ridiculous. We were actually a better draw in Ohio that most of the colleges. SG: What surprised me was about grown men and women putting a negative spin on a group of kids. You’d think they want to help you along, but there was a lot of people who wanted to see you fail. It was strange that grown people had it out for us. HC: Dru, your father [Dru Joyce II] is a very introspective man and a supreme student of the game and human nature. How did that make him, outside being your coach, a different man as a father? DJ: It’s hard to separate him on-the-court and in being my father. We were on the court as much as I was at home. They say there is a separation between father and coach, there wasn’t with us. He was always my father and my coach. He coaches basketball, but he also coaches life. You make think he’s talking about basketball, but when you break it down it’s really a life lesson. He’s getting you ready for something you can’t envision yet. 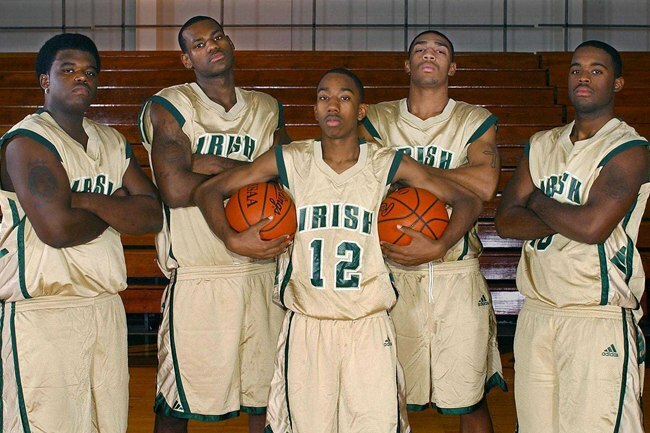 DEE-fense: Patrick McDonald, Willie McGee, Romeo Travis, Dru Joyce III, Sian Cotton and LeBron James in Chicago, Illinois, on August 11, 2009. HC: What impressed me the most about your team was the determination to find the best in the country and take them on. What was the most satisfying aspect of beating a team that took you for granted being from Akron or simply didn’t give you any respect? RT: Oakhill was probably the biggest game for me because we lost to them the previous two years and their coach was talking too much and wasn’t really worried about the game, they had eight Division 1 players on the team. That was the most satisfying victory for me, because they simply thought they were better than us. DJ: That coach called us a junior varsity team, and we were coming off a state championship. The previous game was the toughest of that season, we really should have won that one, we let it slip away. He then had the nerve to not give us respect and call us a junior varsity team. HC: Can anyone give an example of how did your approach to the game of basketball help you in other areas of life? Were you generally better students because of or did the practice and play of basketball get in the way of that? RT: It made me better prepared for life, because before I really got into basketball I wasn’t taking responsibility for my own actions. I did wanted, I was kind of a loose cannon. I never had a father figure or another male telling me what to do. Basketball allowed me to adjust to that and accept criticism. That helped me grow as a man. WM: When sports becomes a factor it keeps you honest, that’s what I maintain. I kept up with my books because it gave me an opportunity to play. I was fortunate to take that approach. HC: What type of behavior for you as a child or teen in the film really made you cringe? Is there anything you’d like to take back? RT: I definitely wish I was a little more mature than what is in the film. I let my emotions control me, and I didn’t let stuff go so easily. If you don’t control your emotions you don’t make good decisions. DJ: The emotions were also some of our best qualities. I care so much and there were times in the film where my emotions got out of control, and we were in too deep. But those were the qualities that made me the player that I am today. HC: Lebron talked last night about the ‘brains of basketball’ that you guys had, that even players in the NBA don’t possess. Who was the smartest ballplayer of the fab five and can you give an example of his court sense? RT: Everyone brought different elements because we all played different positions. Everyone brought their game. Dru brought the point guard knowledge, Sian brought that defensive post player, Willie brought the passion and determination to the game. Each person saw it differently, but winning made it the same. WM: I think we all were taught the game, and we had a good understanding of the game even before we got to high school. I think Coach Dru did a good job of showing us the fundamentals. When we got to high school, that’s why we did so well as a unit. We were all on the same page, we understood the game and we were ready to compete. DJ: I think the biggest thing was we were always willing to learn. Whether it was from the coach or Willie, Sian, Romeo and LeBron. That plays tribute to your I.Q. when you’re willing to learn and handle criticism. That’s why we were able to understand the game, because we never shut it down and said we know everything about basketball. Even when we lost, we learned from it. HC: I played for a Catholic high school myself. What is your opinion about evoking God or Jesus in sports or game performance, considering the other team might be praying just as hard? SC: We never prayed for God to help us to win. We prayed to God to help us to play hard, play smart and keep our head and integrity. And that no one would get hurt, on either team. DJ: It was a reminder that playing the game is a blessing. Not everyone has a chance to play in a sold-out arena, and we could represent. WM: It was huge for me. Coach Dru introducing God to me and realizing what a privilege it was to play basketball. Before this happened, basketball was everything over and above school, family. Coach Dru showed it to me in a different light. Then after my injury, my faith got me through school and got me to college. HC: How do you relate to William Gates and Arthur Agee, the stars of the other great high school basketball documentary, Hoop Dreams? RT: I relate to Arthur Agee because of his past and his family issues. I’ve dealt with that and I deal with it now. Being in the bad situation off the court can hinder your on-court activities. That is how I relate to him. WM: I can relate to Arthur Agee as well, some of the struggles he went through I faced right here in Chicago. And having someone who was in a position to help me better myself, I was very fortunate. My connection to it is when Agee transferred to Marshall, his high school coach was my father’s coach. When I found out our film was a documentary, the first thing I asked if it would be like ‘Hoop Dreams.’ When he said yeah, I was pleased because that was a pretty powerful film for me. HC: Sometimes in a sports position you are asked to represent the entire African American community. What does that mean to you and what can you tell me about that representation that you think the average American doesn’t know? RT: It makes me proud to be able to represent anything. To stand for something means a lot, because that means people respect you and hold your position. They want you to be their catalyst and show people how you feel, because they don’t have a voice. SC: I feel the same way about the pride. At times, though, it’s a double edged sword – it can work with you or work against you. I feel that all of us here, as well as LeBron, are special people. I believe in God and everything happens for a reason. And I believe we were put in this position for a reason. The Lord doesn’t give you anything that you can’t handle. And we could handle it. Submitted by Anonymous (not verified) on December 12, 2009 - 7:59am. Somebody sold these boys a bill of goods if they believe that Coach Smith would say anything like that about them. He doesn’t talk like about any team they play, especially one with somebody named Lebron on the roster. I remember a personal conversation with him where he raved about both Lebron and the team. This “disrespect card” is a cheap motivational trick used by coaches who are desperate to get their team up to play a stronger opponent. I get that. Oak Hill faces that kind of stuff with EVERY team they play. Give it a rest Dru, and just share how much it meant to beat such a good team on the third try!